Ultimate Oreo Cheesecake Recipe - The Most Amazing Oreo Cheesecake! You’ll love this decadent Oreo cheesecake recipe. Made with layers of Oreo mousse, Oreo cheesecake, chocolate ganache, brownie, then covered in frosting & crushed Oreos. This is truly the best Oreo cheesecake! Every layer gets better and better in this easy Oreo cheesecake. 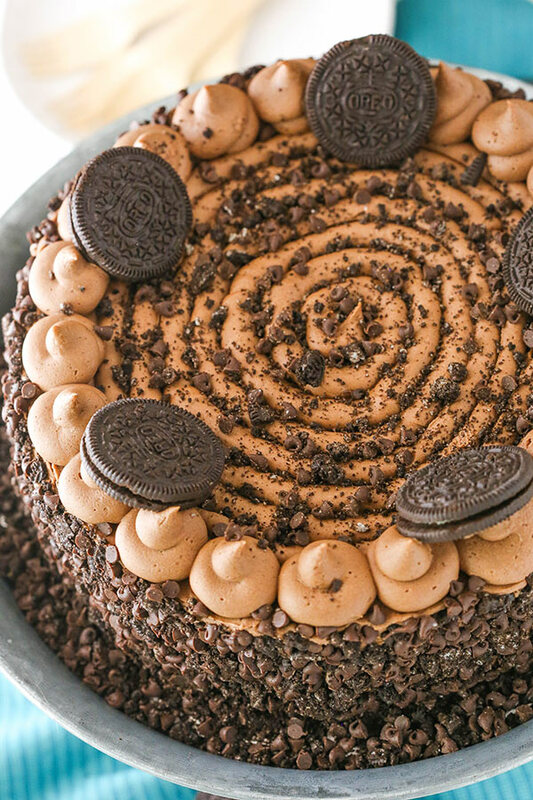 It’s full of Oreos and different textures, making it the Ultimate Oreo Cheesecake! 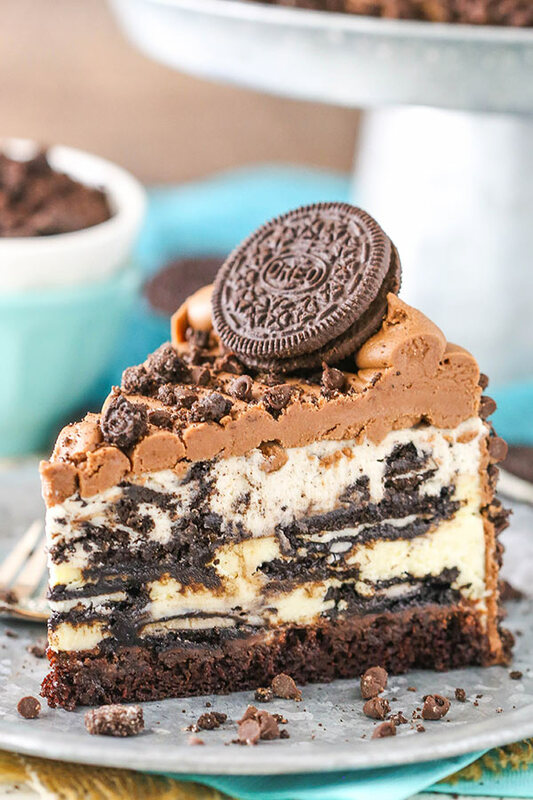 Truth be told, this cheesecake is not only a wonderful Oreo Cheesecake, it’s also a copycat version of the Cheesecake Factory’s Oreo Dream Extreme Cheesecake. Given that I’m a big cheesecake fan, their cheesecakes are some of my faves and recreating them at home is so fun for me. If you haven’t seen my others so far, there’s the Banana Cream Cheesecake, Chris’s Outrageous Cheesecake and the Kahlua Coffee Brownie Cheesecake. This Oreo Cheesecake isn’t hard to make, but it does take a little time and patience for all the different layers. 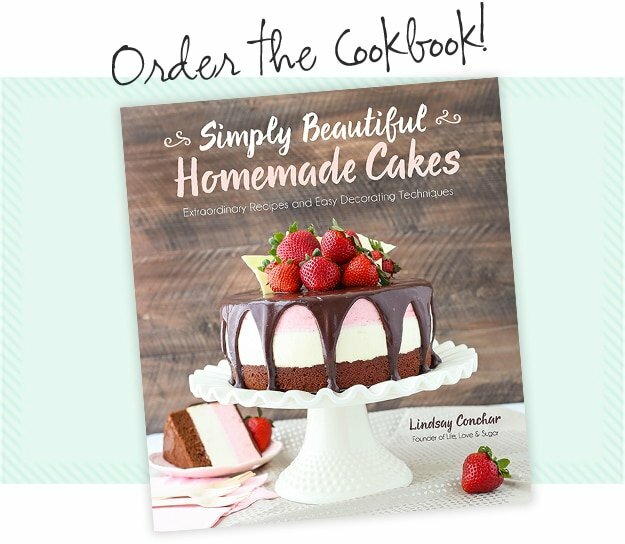 The place to get started is with the chocolate cake on the bottom. One of the best things about it is that it’s a super easy cake to put together. No creaming, no crazy mixing steps, just combining dry ingredients and wet ingredients and mixing them together. 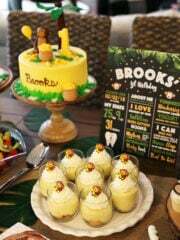 Pour the cake batter into a springform pan and bake. It’ll be important that the springform pan you use doesn’t leak. The cake batter is quite thin and will drip out otherwise. The best way to test your pan is to put some water in it and see if it leaks. Once your cake layer bakes, let it cool and clean off your springform pan to get it ready for the next steps. 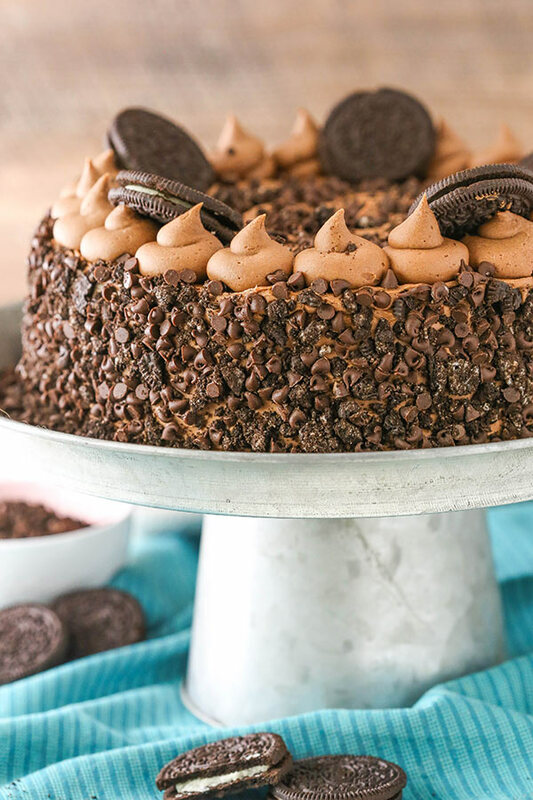 The cake layer is topped with a thin layer of chocolate ganache and then topped with the Oreo cheesecake filling. The cheesecake filling is layered with about 30 Oreos! Yum! There are three layers of Oreos that are added in their whole form – although you could certainly chop them up if you preferred. 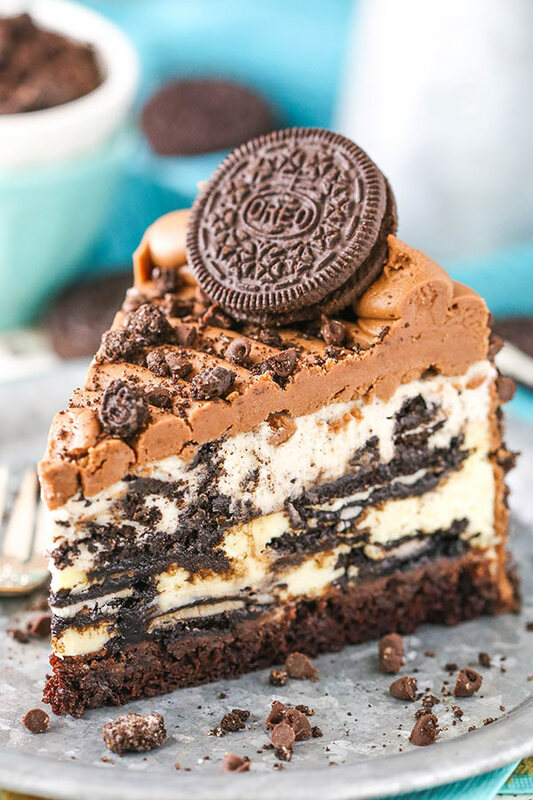 The top layer of Oreos sits right on top of the cheesecake while it bakes, which is perfectly fine. They may firm up a touch during baking, but once the mousse is added on top, the moisture sets in and all is good in Oreo land. Since this is a baked Oreo Cheesecake, we will want to bake it in a water bath. As I mentioned before, a leak-proof pan is always ideal. But often water can get into the pan, so you want to wrap your springform pan well before baking. I actually use a crock pot liner underneath my aluminum foil to add that extra layer of protection. Works every time! After the cheesecake has baked and cooled, it’ll be time to add the Oreo mousse on top. It’s such an easy mousse to make! Some melted white chocolate is combined with whipped cream and then chopped up Oreos are added. The mousse is light and airy and the perfect way to top off the layers of this Oreo cheesecake. When everything is cool and firm, the cheesecake is frosted with one of my favorite chocolate frostings. It’s made with melted chocolate so the chocolate flavor is spot on. More Oreo crumbs and mini chocolate chips are pressed into the sides of the frosted cheesecake and give a lovely hint to all the deliciousness inside. This cheesecake really is the Ultimate Oreo Cheesecake! So many Oreos go into the making of it (you’ll need two packages), the layers all compliment each other and are so fun and you won’t be able to stop eating it. 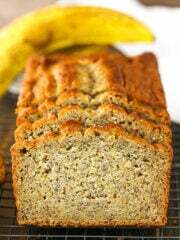 I shared it with the fam – husband, dad and nieces – and they all loved it. Around here, we love to just grab forks and dig in and this cheesecake was perfect for that. The Oreo cheesecake didn’t stand a chance against my nieces, who devoured and loved every bite! I hope you do too! 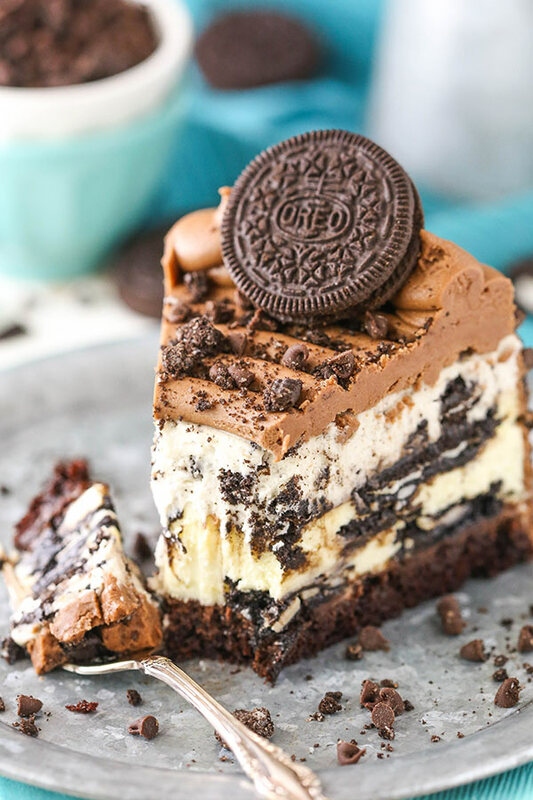 The BEST Oreo Cheesecake you’ll ever make! An amazing cheesecake with layers of Oreo mousse, Oreo cheesecake, chocolate ganache, brownie & crushed Oreos. 2. In a medium sized bowl, combine the flour, sugar, cocoa, baking soda, baking powder and salt. Whisk until well combined. 3. In another medium sized bowl, combine the milk, vegetable oil, vanilla extract and egg white. Whisk until well combined. 4. Add the dry ingredients to the wet ingredients and whisk together until well combined. 5. Add the water and whisk until well combined. Batter will be thin. 6. Pour the batter into the springform pan and bake for 12-15 minutes, or until a toothpick inserted in the middle comes out with a few crumbs. 7. 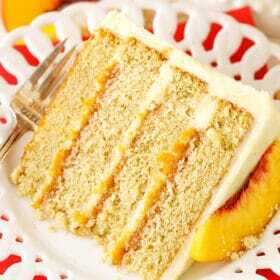 Remove cake from the pan and set aside on a cooling rack to cool. Wash the springform pan for use again later. 8. While the cake is cooling, make the cheesecake filling. Add the chocolate chips to a medium sized bowl. 9. Heat the heavy whipping cream until it begins to boil, then pour it over the chocolate chips and add the vanilla extract. Allow the mixture to sit for 3-4 minutes, then whisk until smooth. Set aside. 10. 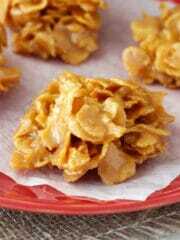 In a large mixer bowl, add the cream cheese, sugar and flour and beat on low speed until completely combined and smooth. Be sure to use low speed to reduce the amount of air added to the batter, which can cause cracks. Scrape down the sides of the bowl. 11. Add the sour cream and vanilla extract mix on low speed until well combined. 12. Add the eggs one at a time, mixing slowly to combine after each addition. Scrape down the sides of the bowl as needed to make sure everything is well combined. 13. Reduce the oven temperature to 300°F (148°C). Re-line the bottom of the 9 inch springform pan with parchment paper and spray the sides with non-stick spray. You want to be sure it’s well done so that they cheesecake doesn’t stick to the sides after baking. Prepare the pan for a water bath by wrapping the outside of the pan with aluminum foil. Here’s how I like to prepare my pans for a water bath to prevent leaking. 14. Reset the springform pan edges around the cooled chocolate cake, then pour the melted chocolate mixture on top of the cake. Spread it into an even layer. 15. Add the about 1/3 of the cheesecake filling to the pan and spread into an even layer. Top the filling with 10-12 Oreos (leave them whole). 16. Add another 1/3 of the cheesecake filling and spread into an even layer. Top the filling with another 7-8 Oreos, trying to offset their position from the ones on the first layer. 17. Add the remaining 1/3 of the filling, spread into an even layer, then top with another 10-12 Oreos. The Oreos will sit on top of the cheesecake. 18. Place the springform pan inside another larger pan. Fill the outside pan with enough warm water to go about halfway up the sides of the springform pan. The water should not go above the top edge of the aluminum foil on the springform pan. 19. Bake the cheesecake for 45 minutes. The center should be set, but still jiggly. 20. Turn off the oven and leave the door closed for 20 minutes. The cheesecake will continue to cook, but slowly begin to cool as well. 21. Crack the door of the oven for 30 minutes to allow the cheesecake to continue to cool slowly. This process helps prevent cracking. 21. 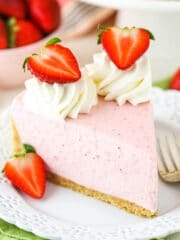 Remove the cheesecake from the oven and water bath wrapping (leave it in the springform pan) and refrigerate until firm, 5-6 hours or overnight. 23. To make the Oreo mousse, add the white chocolate chips and 2 tbsp (30ml) of heavy whipping cream to a small bowl. Microwave in 10 second increments until melted and smooth. Set aside to cool to about room temperature. 24. Whip remaining 1 cup (240ml) of heavy whipping cream, powdered sugar and vanilla extract in a large mixer bowl fitted with the whisk attachment until stiff peaks form. 25. Carefully fold about 1/3 of the whipped cream into the cooled white chocolate mixture until combined. 26. Fold in the remaining whipped cream until well combined, then add the chopped Oreos – crumbs and all. 27. Spoon the Oreo mousse on top of the cooled cheesecake and spread into an even layer. Place the cheesecake back in the fridge until the mousse layer is cold and firm, 2-3 hours. 28. When the mousse layer is cold and firm, remove the cheesecake from the springform pan. 29. To make the frosting, beat the butter until smooth. 30. Add the melted chocolate and mix until smooth and well combined. 31. Slowly add the powdered sugar and salt, mixing until smooth and well combined. 32. 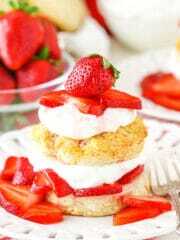 Add 4-5 tablespoons of cream, as needed, to get the right consistency frosting. 33. 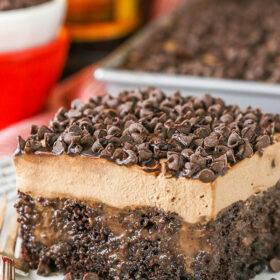 Place the cheesecake on a serving plate and frost the edges with the chocolate frosting. 34. Combine the mini chocolate chips and crushed Oreos and press them into the frosting on the sides of the cake. 35. Pipe frosting onto the top of the cheesecake in a spiral, beginning from the middle of the cheesecake and piping towards the edge. 36. 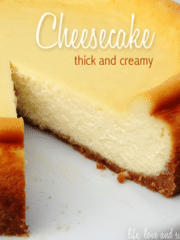 Use the remaining frosting to pipe swirls around the outer edge of the top of the cheesecake. 37. Sprinkle some of the remaining mini chocolate chips and Oreo crumbs on the top of the cheesecake, then garnish with a few Oreos. 38. Refrigerate the cheesecake until ready to serve. The frosting can get a bit firm, so I suggest leaving it out for about 45 minutes before serving to make it easier to slice. 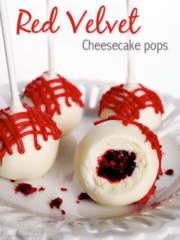 Cheesecake is best when well covered and eaten within 4-5 days. Not sure where 3 h and 45 minutes as a total time came from. This thing takes almost an entire day to make following your instructions. You chill the cheesecake 5-6 hours or overnight, then chill the mousse 2-3 hours. That alone adds an extra 7-9 hours to the preparation time. I really think this should be mentioned in the notes instead of just ‘plus cooling time’. 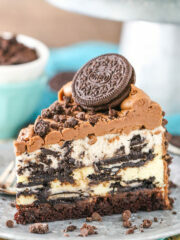 Delicious oreo cheesecake recipe! Gorgeous too, everyone was impressed by the way it looked and the way it tasted. Definitely took more than 3-4 hours but soooo worth it. Was AMAZING. 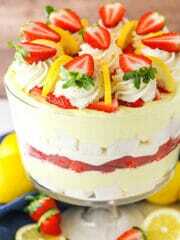 Another showstopper dessert! 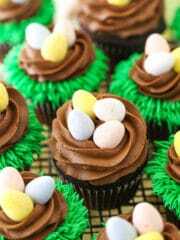 I just love your site and all your recipes are amazing. This tasted exactly like the cheesecake factory’s version. Thanks Lindsay, my family loved it!